And be running and jumping at play. Wading a puddle or jumping a pool. Baby Footprint Poems Free printable 'Congratulations and Welcome, I Love You' Announcements concerning the new baby son, daughter, brother, sister, grandson, granddaughter you're having, expecting or has been born /unborn, on time or premature, whether first baby boy or girl, or twins from friends, Mom, Mum, Mother, Father, Dad, Daddy, Grandparents, baby sitter. 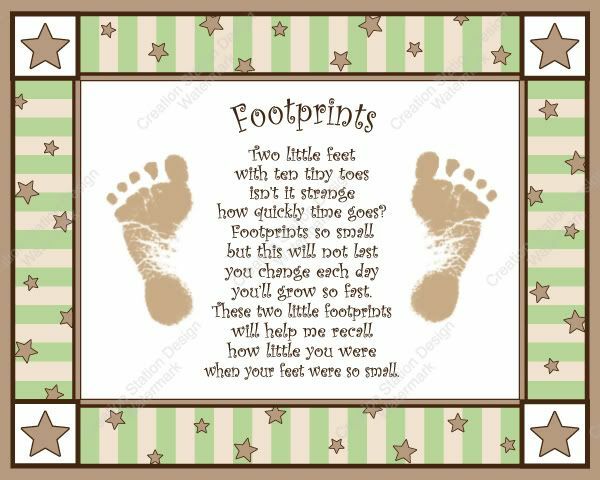 These short, funny, inspirational, Christian and non religious New Baby poems, verses, quotes, sayings, well wishing dedications are free, a gift from us, for footprint gifts. Take a stroll or run a race. Or I'll join a ballet corps. Or explore the ocean floor. Just to wiggle all their toes.